Make music together at home with your baby or toddler with Rainbow Songs’ early childhood music CDs. Make music together with your baby and toddler with our collection of 7 early childhood music CDs! Want to listen to the fun kids’ songs that you sing in your Rainbow Songs music class with your baby or toddler? Forget the lyrics to one of the tunes? Love our baby and toddler classes and want to recreate our circle time at home? Making music together at home with your toddler or infant is fun for the whole family! Choose from one of the 7 Rainbow Songs awards winning early childhood music CDs and have a great time singing along. Each CD comes with a colourful booklet with colourful images. As well, the lyrics to each song are there for you too. Below is a short summary of each CD. Remember, if you enroll in a baby or toddler Rainbow Songs music class within the first three weeks of the session you receive a free CD! As well, Rainbow Songs founder, Mike Whitla, has started a video channel. Find lots of these fun children’s and baby songs on Youtube at Howdytoons! Here’s the titles of the amazing 7 Rainbow Songs CDs. Keep reading below to find out details about each of the cds. Oh Baby! Contains a fun assortment of bluegrass, soul, rock and traditional children’s songs to soothe and entertain adults and babies alike. This CD is a fantastic accompaniment to the Rainbow Songs Under 1 Year old baby music program. The music on this CD of baby songs is a wonderful way to enrich music in early childhood. 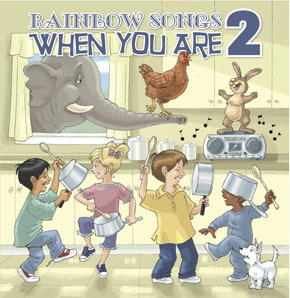 The CD includes many of the songs sung in the Rainbow Songs baby classes. It also contains favourites from our older programs too…there’s something here for everyone! What Shall We Do With the Sleeping Baby? 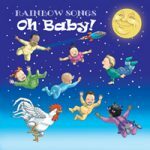 Just like the “Oh Baby!” CD, “When You Are One!” is a great resource to complement Rainbow Songs’ 1-2 Year old music class. This CD has many of the songs you know and love from fun classes for toddlers, plus extra songs too! Have fun singing class favourites and new tunes too! Purchase When You Are One! Track List for When You Are One! Walk and You Walk and You Walk and You Stop! When You Are 2 is the perfect addition to the Rainbow Songs toddler 2-4 year old music class. Just like its predecessors, Oh Baby! and When You Are One!, this CD was created with the particular age range in mind. There are lots of songs from the toddler music classes plus sing a longs, get up and dance tunes and much more! Buy When You Are 2. This CD has many favourite activity songs from our toddler music class. You can reenact our classes while singing along! Walk like an elephant, ribbit like a frog, put your finger in the air and put your finger in the air! Elephants Have Wrinkles is the first recording of award winning children’s entertainer and Rainbow Songs founder Mike Whitla. Due to demand, the CD was released again in 2007 with 5 new songs. 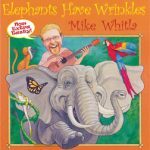 This lively recording features kids songs both familiar and new that will get you and your child singing along! Enjoy Rainbow Songs’ first collection of songs for children. This high-energy recording of music for kids blends traditional North American music with a commitment to bringing the best of music-making to children’s music. From R&B to funk, Bluegrass to Reggae, and Rock & Roll, the listener will enjoy this CD again and again. The music on this CD has proven itself a classic in many Rainbow Songs homes and was awarded a Parents’ Choice Foundation award, a National Parenting Publications award and the Indie award for Best Children’s Recording. Sing a long to these great songs for kids! Get up and dance to the music! Love having a dance party with your child? Then this is the CD for you! A ding-a-ling from the handlebars kicks off Let’s Boogie! with “Bicycle,” a solid rock up-tem po number that puts a little punk in a nod to Queen. A reference to Deep Purple follows on “Faster Scooter Cat,” in which the band plays some great riffs with energy and flair. If there is such a thing as funk-gospel dance music for little kids, “The Freeze” is it. 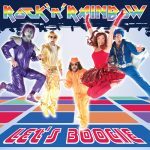 “Let’s Boogie,” is a full on disco tribute that issues yet another call to get up off the couch and shake it on the dance floor. The funky counting song, “Five Senses,” offers a tip of the hat to the Sesame Street “Pinball Number Count” song. Another bright spot is “Hokey Funky.” This tune has a refreshing take-off on the classic Hokey Pokey song that lets listeners know that FUNK is what it’s all about! Sing and Dance to these funky fun songs for kids! Track List for Let’s Boogie! Dinostory is a Rock’n’Roll musical about dinosaurs!! 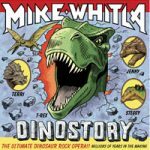 Mike Whitla, founder of Rainbow Songs, creates a musical journey back in time to the Cretaceous period. The adventure takes place 100 million years ago when the dinosaurs ruled the earth. It tells the story of a baby triceratops who, as an egg, is separated from her siblings and hatched on her own. Little Terri has to go out into the world and find where she belongs. Terri’s challenges include finding food and drink as well as searching for a community that she can call home. All your favourite Rainbow Songs performers are featured on this CD. This Cd was the winner of 2011 Parents’ Choice Award and 2011 National Parenting Publications Award amongst other awards!